State Senator Art Linares (right). "We are proud of our facility in Portland and the work that our 40 employees do in that facility,” Westhaver said. 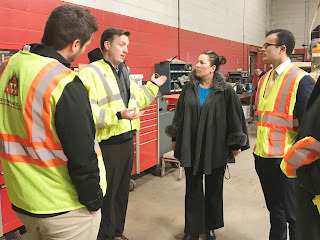 “Showcasing that to Rep. Ziobron and Sen. Linares is our pleasure and I'm excited at their commitment to working with DOT to help us continue to grow our facility, hire more employees and continue building Red Technologies in Connecticut,"